For all the shoes you could need, Buy and Walk, online at BuyandWalk.com, is your one-stop shop. With athletic, basketball, casual, Chuck Taylor, outdoor, retro, running, sports, and walking for both men and women, and shoes for kids of all ages too, there is nothing you won’t find to wear on your feet at Buy and Walk. They also supply the most popular brands in footwear including Adidas, Reebok, Converse, Saucony, Fila, Hi-Tec, and the list goes on. Shop by gender, brand, size, or color, and never be disappointed at Buy and Walk. For all the hottest Buy and Walk coupon codes, Buy and Walk discounts, and Buy and Walk promos, check out RetailSteal.com. Buy and Walk offers free shipping and free returns on all orders, and your order is guaranteed to be delivered within 3-5 business days. 2-day and next day shipping are also available. See BuyandWalk.com for details and exclusions that may apply. Spend $100 or more on your order from Buy and Walk and use this coupon code to save $15 on your order. Click to save. Head over to Buy and Walk today and use our coupon code to receive 10% savings for a limited time. Shop the sale section at Buy and Walk and save 20% on select items. Shop online at BuyAndWalk.com and enjoy a 15% discount on your purchase. Click this link to activate your savings on orders of $100+. Save 5% on every single order when you shop at Buy and Walk and click on this link. Get free shipping on all orders from BuyandWalk.com. Click link to start shopping. Click link to save $15 off your order of $100 or more from BuyAndWalk.com. 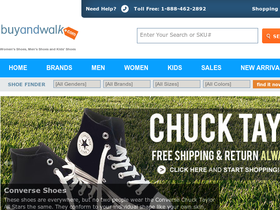 Shop at BuyandWalk for Chuck Taylor Converse shoes, starting as low as $32. Click here to check them out. At BuyandWalk.com, buy Adidas Approach Feather Low shoes for as low as $54.90. Click link to purchase. Shop from Buy And Walk for no sales tax on your order. Click link to save. Use our coupon code online at Gravity Defyer to receive a $10 discount on your purchase. Shop at Gravity Defyer and enjoy $30 savings on orders $120+. Click here for code. Enjoy free shipping on sitewide from Gravity Defyer. Save up to 35% on women's athletic shoes at Gravity Defyer. Click link now to save. Check out Gravity Defyer to find gifts starting at $29.95. Click link now to see the selection.